Createspace Independent Publishing Platform, 9781470161989, 222pp. 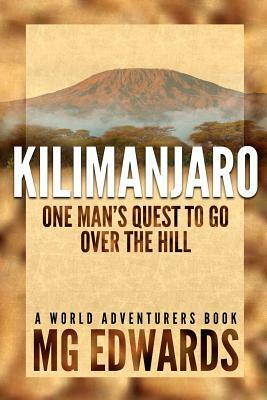 The first novel in the World Adventurers Series, Kilimanjaro: One Man's Quest to Go Over the Hill chronicles the author's attempt to summit Mount Kilimanjaro, the highest mountain in Africa. At forty years old and on the verge of a mid-life crisis, he decided to make a dramatic life change by climbing a mountain. This is his true story of facing Kilimanjaro and life's challenges at middle age. This book is for anyone who feels "over the hill" and needs encouragement to make a major life change in the face of difficult odds. It's also for the casual climber or hiker interested in climbing one of the world's tallest mountains. Filled with insights and advice for those who are contemplating their own Kilimanjaro climb, this book will put you on the mountain and inspire you to go over it. Kilimanjaro: One Man's Quest to Go Over the Hill features more than 60 photos from the author's trek. M.G. Edwards is a writer of books and stories in the mystery, thriller and science fiction-fantasy genres. He also writes travel adventures. A former U.S. diplomat, he served in South Korea, Paraguay, and Zambia before leaving the Foreign Service in 2011 to write full time. He lives in Bangkok, Thailand with his wife Jing and son Alex. Edwards published "Alexander the Salamander," a children's e-book he co-wrote with his son Alex, in May 2011. He released a collection of short stories from different genres, "Real Dreams: Thirty Years of Short Stories," in November 2011. His latest book, "Kilimanjaro: One Man's Quest to Go Over the Hill," published in April 2012, chronicles his quest to climb Mount Kilimanjaro, Africa's highest mountain. It's the first book in the World Adventurers Series of travel adventures. For more books or stories by M.G. Edwards, visit his web site at www.mgedwards.com, his blog, worldadventurers.wordpress.com, or by e-mail at me@mgedwards.com.